Literally following in the footsteps of Oscar-winning cinematographers such as Dean Semmler ACS ASC, and Don McAlpine ACS, Andrew began his career as Television Operations trainee with the highly-respected Australian Broadcasting Corporation in Sydney, Australia, in 1984, following an intensive selection program. After comprehensive station-wide training, Andrew joined the Field Camera section in 1986, as a camera assistant. Obtaining credits on countless long-form dramas and documentaries – including Police Rescue, Come In Spinner, A Big Country and General Practice – Andrew subsequently commenced shooting for ABC-TV News in 1990, The 7.30 Report in1992, and by1994 was shooting the national flagship current affairs program Four Corners, at the age of 28. Seeking a return to non-reality film-making, in 1997 Andrew joined Sydney’s freelance ranks via the acclaimed Nine Network series Water Rats, working as 1st A.C. on four series. Subsequently, he has photographed a wide variety of quality film and television productions, and is the recipient of a number of industry and peer awards. Andrew shot his first major television commercial in 1997, and has since shot countless television commercials and promotional spots for diverse clients, including FTA and cable television networks, Coke, Big W, Uncle Tobys, Levi Strauss, Nike, and Telstra amongst others. Although chiefly focused on TVCs and promos, Andrew’s services are also still in high demand for local and international corporate video, and broadcast television productions, including Bondi Rescue, Julia Zemiro’s Home Delivery, Grand Designs Australia, Top Gear Australia, and children’s channel Nickelodeon. 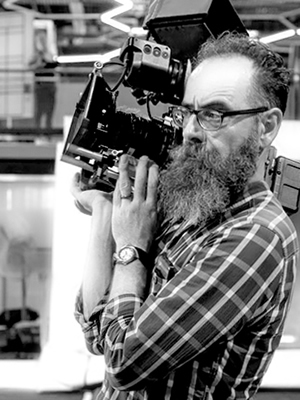 Given his broadcast background, Andrew embraced the early adoption of High Definition and Digital Cinema (4K) cameras, utilizing a range of project-specific options from Arri, Canon, Sony, and RED. After intensive research (both theoretical and empirical), in July 2015 he took delivery of a new Sony PMW-F55, and is thoroughly happy with it’s ergonomics, flexibility, and of course, imagery. In 2011, Andrew formalized his extensive Steadicam® experience, completing a five-day Tiffen ‘Gold Workshop’, with inventor Garrett Brown and U.S. industry stalwart Jerry Holway. Currently flying a PRO III rig (suitable for all camera types), Andrew now boasts Steadicam® credits on numerous dramatic, factual, and broadcast productions. As a marriage of visual art, technology, and years of elite athletic competition, flying cameras on a Steadicam® is a perfect match for Andrew’s visual and physical skills. Andrew enjoys a long history as a sponsored cross-country and downhill mountain-bike racer. He is also a busy commercial stills photographer, a surfer, an AWARD-trained copywriter, and an active member of the Australian Cinematographers’ Society (ACS). He has worked as a magazine sub-editor, enjoys hanging out of helicopters, architecture, amateur psychology, politics, kayaking, riding his KTM RC8 1190 superbike in a way that sometimes attracts the NSW Highway Patrol, and can snow-ski backwards whilst shooting with a shoulder-mount camera. By contrast, Andrew was definitely not the main camera for The Chaser’s War on Everything infamous APEC stunt in 2007, did not supply the two motorcyclists who also weren’t there, doesn’t know Julian Morrow or Chas Lucciardello, and even if you actually saw Andrew there, it wasn’t him. He was certainly not arrested near John Howard in Queensland with Craig Reucassel, either. When it comes to RMK Crew, “Andrew McClymont” is probably the name I say the most. He’s my most requested camera op. His work ethic is great, he’s an absolute pleasure to be around, and he’s bloody good at what he does. Every time I’ve worked with him over the past few years, I’ve had a perfect experience and the end product has always been something I’m very happy with. He knows his stuff, makes great suggestions, and genuinely cares about producing a good quality product. He’s one of my favourite people to work with.